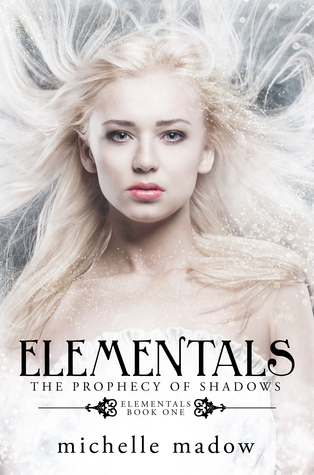 Presenting Elementals #1 The Prophecy of Shadows by Michelle Madow. Witches are real. They're descendants of the Olympian gods. And now, five teen witches gifted with elemental powers must fight to stop a war against the Titans. Mix Harry Potter, Percy Jackson, Greek Mythology and your modern American public schools and you get Michelle Madow's latest offering the Elementals series with the first book, 'The Prophecy of Shadows'. After transcendent romance and nuances of LA high society. Madow next looks towards Greek Mythology in the modern era. From what I understand she began this story way before but only now publishing it. So the Greek Gods are real. Witches are real as well and they are the descendants of the Gods. And Nicole Cassidy just happens to find herself smack-dab in the middle of all this madness. She was a pretty likeable protagonist. Moving to a new place and making all those connections are hard enough but Nicole finds out about a supposedly hidden part of herself there. That she has magic in her blood ..... Totally a whole new angle to get used to. She had a good head on her shoulder. Brave and kind. And very very powerful. She knows how to deal with those around her. She catches the interest of the smoldering hot Blake and there were instant attraction there but she knows he has a girlfriend, Danielle so she backs off. She also finds a friend in Kate and Chris. Through coincidence or providence them 5 come together under the passing Olympian Comet unlocking powers that sets destiny in motion, throwing their thought controlled magic out of wack. Really liked how the author implemented the color spectrum and meditation as the basics of her story. Earth, Fir, Water, Air and Aether (or Spirit) are the ethical building blocks of life and the group unlocking such abilities and going on a scavenger hunt for a prophecy that is precursor to events of the future was an exciting endeavor. I didn't really like how the prophecy is worded. It felt too generic when all the other examples in other much more famous ones for the poetic way. Maybe filled with cliches and the writing may seem too simple at times but it was a fun and a very quick read. More than excited for the sequel The Blood of Hydra which comes out in April. "Magical and Mythical. With the promise of a grand adventure"
You had me at Greek gods and witches. :D I think I can handle the prophesies not being so great if the rest of the worldbuilding is good. At least you want to read the next one! Ooh, I do really love the sound of a HP/PJ mix, with some elemental magic through in! Seriously, some of my favourite things. I can't believe this is the first I'm hearing of this one!